Markets are lower on no real news. Bonds and MBS are up. Home Prices rose .87% month-over-month and 4.56% year-over-year according to Case-Shiller. This is January data. The West and Southwest continues to outperform the Midwest and Northeast. A measure of housing market “healthiness” indicates the housing market is in the best shape since 2001. It looks like we are close to an agreement to extend talks with Iran for 90 days and to outline the big steps needed to get a deal. The main sticking points seem to revolve around the actual mechanics of lifting the sanctions. The main thing to keep in mind is that one way or another, the sanctions will probably be lifted and a big new oil producer will begin dumping crude on world markets. As we get closer to “liftoff,” which is Fed-speak for increasing interest rates, market professionals are worried about the possibility of more volatility in the bond markets. They point to one trading day in October, where the 10 year bond yield traded in a 40 basis point range intraday. A combination of automated trading and the unintended consequences of regulation have hampered liquidity in Treasury markets during periods of volatility. Speaking of bond market volatility, the government will release the jobs report on Friday as scheduled, however the stock market will be closed and SIFMA is recommending a noon close in bonds. Suffice it to say that trading desks will be thinly staffed and we could see some volatility in rates. I don’t anticipate much of a reaction in the bond market unless payrolls fall off a cliff or we see a big uptick in wages. Markets are higher this morning on overseas strength. Bonds and MBS are up small. Personal Income came in at .4%, higher than the Street estimate. Personal Spending however disappointed. The PCE Core rate (the inflation rate preferred by the Fed) came in at 1.4%, lower than the Fed’s 2% target. Pending Home Sales rose 3.1% in February, higher than the estimate. The Northeast was affected by the weather, but the Midwest jumped. February is a short month and during the seasonal slow period, so it is hard to read too much into these numbers. Beard has a blog. Supposedly he will dish on his critics and go after the “audit the Fed” crowd. It might be interesting as a “Talking Points Memo” on monetary policy, where surrogates argue with critics, leaving the official participants out of it. Markets are lower this morning after the final revision to fourth quarter GDP came in lower than expected. Bonds and MBS are up. The final revision to fourth quarter GDP came in at 2.2%, flat with the second revision and below the 2.4% street estimate. Personal Consumption was revised upward to 4.4% from 4.2%. The core Personal Consumption Expenditures Index (the preferred measure of inflation for the Fed) came in at 1.1%, well below their 2% target. The University of Michigan Consumer Sentiment index rose to 93 in March. At 1:30 Janet Yellen will be speaking in San Francisco about monetary policy. She probably won’t say anything market-moving, but just be aware. Senate Minority Leader Harry Reid is retiring. NY Senator Chuck Schumer is the favorite to replace him. NV will almost undoubtedly swing Republican. Schumer is generally financial sector friendly, so that should help the business, for what it is worth. Democrats are worrying about 2016 and the fact that their war on Wall Street means banks are pulling back campaign contributions. Also, affordable housing advocates are getting sick and tired of tight credit. Reinhart and Rogoff have another paper about high levels of government debt. It looks at how governments have handled these situations over the past two centuries. Governments will need to be creative in dealing with it, and the solutions will probably involve confiscatory taxes, default, and inflation. Stocks are lower worldwide as the Saudis bomb Shiite rebels in Yemen and the semiconductor sector gets taken tot the woodshed. Bonds and MBS are down. The bombing in Yemen is putting a bid under oil. In economic data this morning, initial jobless claims fell to 282,000 last week from 291,000. This is the lowest reading in 5 weeks. The Markit US Composite PMI rose to 58.5 in March, while the US Services PMI rose to 58.6. Bloomberg Consumer Comfort rose to 45.5 last week. It is looking like the Germanwings crash was a deliberate act. Note that the new security measures designed to keep bad guys out of the cockpit can also keep the good guys out if the bad guy is already inside. Senator Richard Shelby suggests that GSE reform probably isn’t happening this year. And since the following year is an election year, you can probably forget about anything happening until 2016 at the earliest. In the “what passes for analysis” category, CNN wonders if we are in another bubble. Why? Because the Homebuilder ETF (XHB) is back at 2007 levels. Setting aside the idea that ETF valuations can somehow predict where real estate prices go, bubbles require a mindset on the part of buyers and bankers that the asset in question is “special” and cannot fall in value. We will never see another housing bubble in the US, but our grandkids may at some point. Ara Hovnanian weighs in on the housing market and the state of the first time homebuyer. Markets are flat this morning on no major news. Bonds and MBS are flat as well. Mortgage Applications rose 9.5% last week as purchases rose 4.9% and refis rose 12.3%. Refis were 60.5% of all applications last week. Durable Goods orders fell 1.4% in February. Cap Goods Orders Non-Defense / Ex-air (a proxy for business capital investment) fell 1.4%, while January was revised downward from .6% to -.1%. Corporate America is not increasing capacity at all, and is not pursuing expansion opportunities. What do companies with cash burning a hole in their pockets do when there are no great expansion opportunities out there? Buy each other. In a bit of a complicated deal, Heinz is buying Kraft. As oil stays down here, I expect to see some deals in the energy patch. The last time oil was this low (aside from the financial crisis days) we saw some huge deals: Exxon buying Mobil, Conoco buying Philips, and BP buying Amoco. Rents are rising so fast that they are forcing Millennials to buy houses. In fact, Millennials are now a bigger homebuying cohort than Generation X. Student loan debt remains the biggest hurdle, however. As the economy recovers, a lot of pent-up demand is going to be unleashed. We have gone from a glut of housing to an extreme shortage, which means the builders are going to have to bump up production. The economy is already reasonably strong with only 1.1 million housing starts. If we get back to normalcy (1.5 million), that will provide a big boost. Plus construction employs a lot of people. Markets are higher this morning as oil picks up a bid. Bonds and MBS are flattish. The FHFA House Price Index rose .3% in January, lower than expectations. 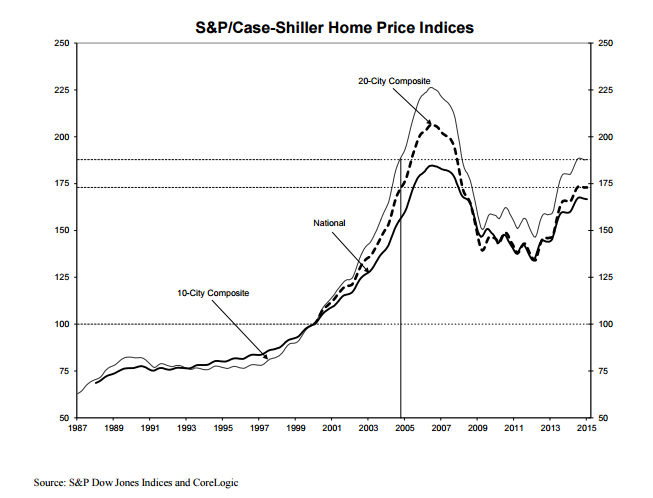 Prices are up 5.1% year-over-year and are now within 3.5% of their peak levels, which corresponds to December 2005 levels. New Home Sales rose in February to a 539k pace from an upward-revised 500k pace in January. New Home Sales are hitting post bubble highs, but are still about 40% of previous peak levels, which were hit about 10 years ago. On Lennar’s first quarter earnings conference call, CEO Stuart Miller had this to say about new home sales: “Pent-up demand is derived from a now multi-year production deficit that is continuing to grow even at current production levels (emphasis mine) At the same time, volume growth has been constrained by overly conservative lending standards, a regulatory environment that discourages mortgage lending and a negative consumer bias overhang against homeownership….While the relationship between pent-up demand, rental rates and mortgage availability continues to direct the housing market, it’s becoming more apparent that the mortgage market is loosening incrementally with time and enabling more demand to be realized as household formation begins to return to more normalized levels. We have believed and we continue to believe that the downside in the housing market is very limited and the upside is very significant (emphasis mine). We believe that the market is downside supported by the many years of production deficits that have yielded a limited supply of both rental and for-sale housing in the country. Any pullback in the housing market would be short-lived as there’s a need for shelter across the country and there’s very little inventory, and almost no likelihood of mortgage foreclosures (emphasis mine) given the stringent underwriting standards of the past years. Inflation is still pretty much nowhere to be found, as the consumer price index rose .2% in February. On a year over year basis, it is flat, while ex-food and energy it is up 1.7%. Certainly if the Fed wants an excuse not to hike rates in June, the lack of inflation is giving them one. Note the Fed prefers to use PCE inflation, not CPI. The Markit US Manufacturing PMI rose in March to 55.3 versus 55.1. 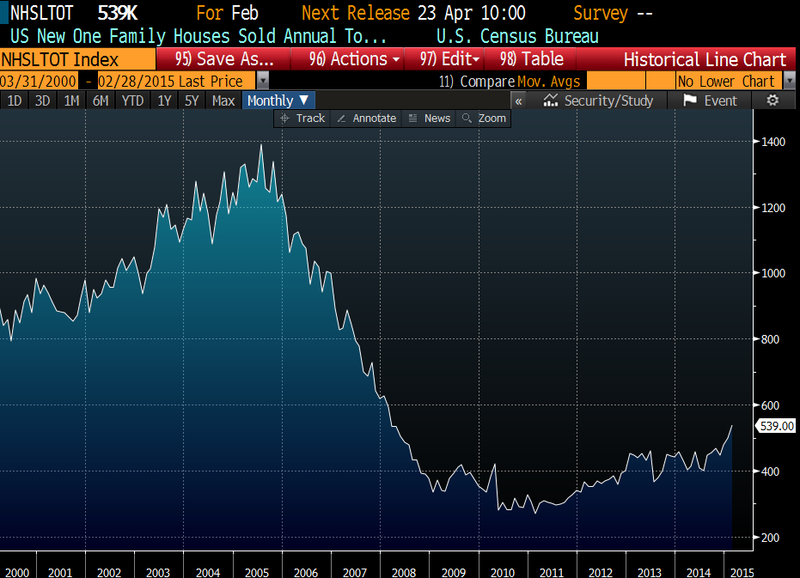 Manufacturing continues to rebound, although it doesn’t employ as many people as it used to. Meanwhile one study shows that up to half of all jobs can be automated over the next 10 – 20 years. The Richmond Fed Manufacturing Index fell to -8 from 0 last month. Markets are flat this morning on no real news. Bonds and MBS are up. Existing Home Sales rose to an annualized pace of 4.88 million in February, up slightly from 4.82 million in January. Note this is probably a weather-driven number and February is still in the seasonally slow period. The median home price was $202,700 which is up 7.5% year-over-year. 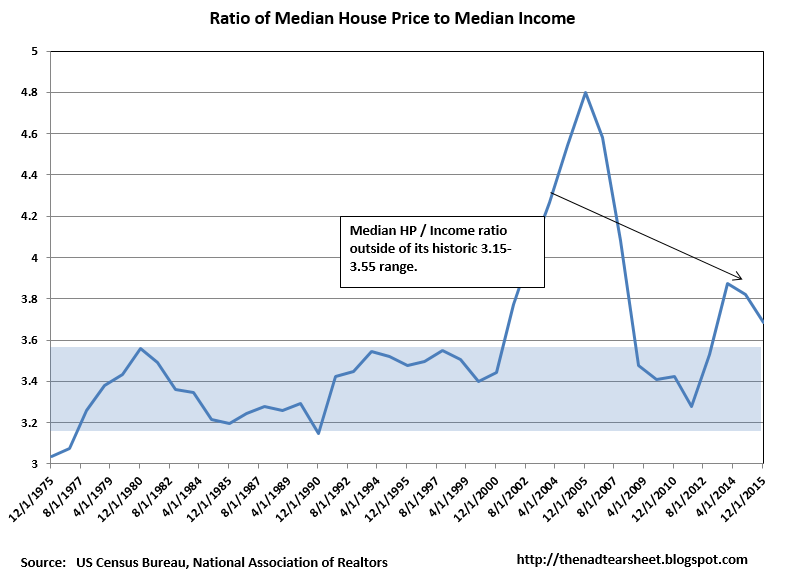 Median income is about $55,000 or so, which means the median house price to median income ratio is sitting at 3.68x, which is on the high side. Historically, that ratio has sat in a range of 3.15x – 3.55x. It means that house prices are probably not going to flatten until we start seeing wage inflation. The Chicago Fed National Activity Index slipped in February as production-related indicators fell. Employment related indicators slipped however were still positive. Poor weather undoubtedly played a role. The housing reform bill is making its way into the House. This bill, called The Partnership to Strengthen Homeownership Act envisions winding down Fan and Fred, and increasing the role of Ginnie Mae. Private mortgage insurance will bear the first 5% of severity with the government bearing losses beyond that. It sounds like this bill is gaining support of Congressional Republicans as well, however understand this bill is the left’s wish list. The left wants to continue social engineering via the housing market while the right wants to decrease the government’s footprint. The social engineering (aka “affordable housing”) stuff will probably be the biggest sticking point. The plan envisions Ginnie Mae’s 10 basis point guarantee fee will be used for affordable housing goals. Note the government plans to wipe out Fannie and Freddie stockholders, although those two stocks are litigation lottery tickets at this point. The low price points in urban areas are beginning to decline again. In many urban areas, the suburbs have recovered, while the inner cities remain weak. I wonder how much property in the inner cities was bought by professional investors who are starting to eye the exit. Rental prices continue to rise, but at some point pros will want to monetize these investments. Of course this also demonstrates one of the issues with the CRA: it demands that bankers ignore location when considering the riskiness of the underlying collateral when pricing credit, when location clearly matters.